The chinotto is a small round citrus fruit, about the size of a ping pong ball. Its bitterish taste gives it a unique and distinctive flavour which means it is not ideal to eat on its own. Instead, an extract of the bittersweet chinotto fruit is used to produce the popular Italian beverage that bears the fruit’s name and makes it totally unique. Chinotto is one of the citrus fruits that is not well known outside Italy. It originates from the orange from which it gets its aromatic taste and intense perfume that is typical of Sicilian citrus. 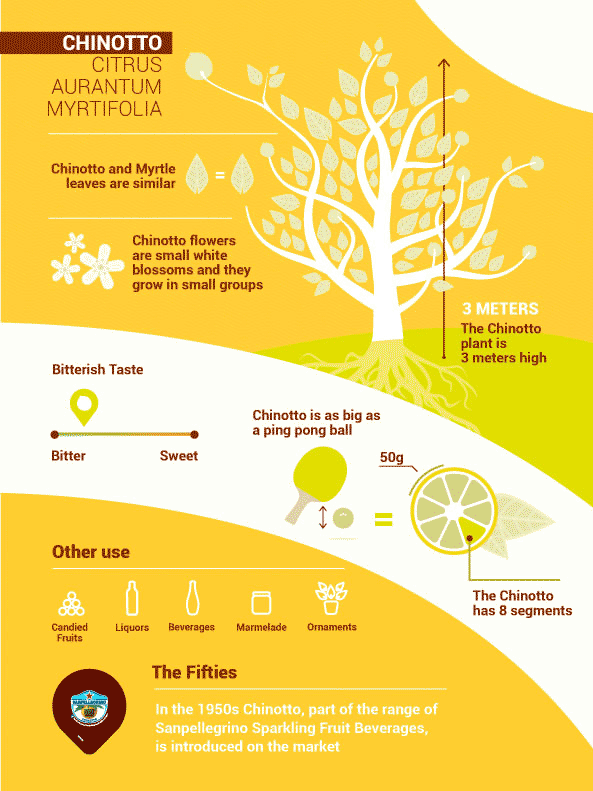 The botanical name for chinotto is Citrus Myrtifolia. The plant’s green leaves, which closely resemble those of the Myrtus, together with its fragrant white flowers, make it very popular as a decorative plant. When growing chinotto fruit starts off a bright green colour and its skin gradually turns orange towards June, as it matures. As with all citrus fruits, the ideal climate is the very heart of Mediterranean. The combination of climates resulting from the hilly landscape and the sea give the fruit its breathtaking mix of colours. There are various ways to enjoy chinotto: it is used as a natural flavouring agent and as the main ingredient in jams, sweets and candied fruits. Candying chinottos (bitter oranges) allows them to be used all year round, even in places where these precious citrus fruits can’t be grown. You do not need any particular ingredients or complex tools, but just a little bit of patience as it will take a fairly long time. To be candied, the chinottos are first pierced and then placed in water for two days so that they lose some of their excessively bitter taste. Then the chinottos are boiled in water for about five minutes. After that the chinottos are immersed in a hot sugar-and-water syrup for a few minutes and then are left to rest for a whole day. This final operation is repeated about five times. Finally the chinotto and syrup mixture is sealed in glass preserving jars.